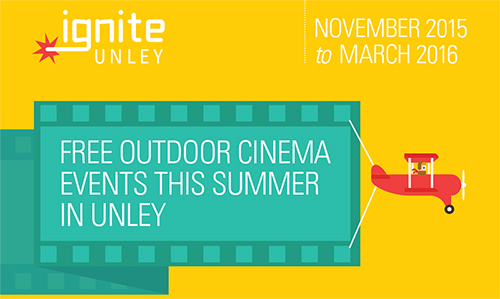 From November 2015 to March 2016, join us at Ignite Unley. Four fun-packed free outdoor cinema events are planned across multiple locations including Unley’s beautiful reserves and parks and the Fullarton Park Community Centre. Food, refreshments and entertainment from 6pm, movies commence at sunset. Bring a picnic rug and settle in for a night of fantastic entertainment with live music, activities for the kids, delicious food, popcorn, coffee and more! Kids dress-ups are encouraged.